For my two year old, it’s all about doing what his big brother does. If big brother jumps, he jumps. If big brother cries, he cries. 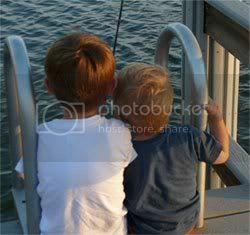 So since Big Brother loves to go fishing with his “Papa” and his Oompah (other grandfather), Little Brother wants to do the same. And of course it’s tough to hold and deal with a real fishing rod at his age. So I was thrilled to have him check out the Pretend & Play Fishing Set for him to play with. He puts his worms on the line and goes pretend fishing all the time now. He’s gearing up for the real thing. Buy the Pretend & Play Fishing Set for $27.99 on the Learning Resources site. Use coupon code BLOG20 for 20% off discount that can be used for an additional discount on already reduced clearance prices. Valid until 6/15/09. As a bonus, Learning Resources is generously giving away 3 sets to 3 lucky Mommies with Style winners. To enter, subscribe to our weekly newsletter. 3 winners will be selected at random from our newsletter subscriber list after May 20th. Incredible that’s a unusual matter to cope with,might this unique ever are actually of use again Most likely this could certainly be a lesson even learned. Rarely has that happened along with this sort of great publicity of a wide range of the effects,some of the fishing may well improve but it’s definitely not about only one human being considering fate is at complete power.